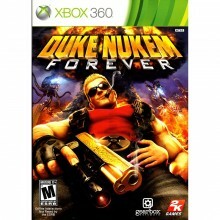 Duke Nukem has been a staple in the video game industry since the early 90’s. In the twenty years since his inception, his character has gone from a quiet CIA operative to a hyper-masculine tough guy that gives some wisecrack joke after every kill he performs. Much like Guns N’ Roses’ Chinese Democracy for the music industry, Duken Nukem Forever, which started production in 1996, seemed like it would never see the light of day. The game takes place about twelve years after the events of Duke Nukem 3D. Duke has achieved great fame from his heroic deeds and is now a worldwide icon. After sampling a video game based on his past heroics (the game Duke plays is actually a redone version of the final level of Duke Nukem 3D), and once he finishes playing the game, he finds out the aliens have once again invaded. After being told by the president to not intervene with violence his house is attacked and so the war begins…again. While the game play and graphics are not as good as you’d expect from a game that had been in development for roughly fifteen years, but it’s still worth playing. In fact, the throwback graphics were almost nice. They gave a nice nostalgic feel to them in the spirit of the previous installments of the game. The handling, in terms of character control, is incredibly frustrating at points and makes certain levels substantially more difficult than they were intended to be. There were also some issues with graphic glitches and frame rate troubles – similar to those in Crysis 2. Despite some of these technical issues the game is still a lot of fun to play, especially if you’re a fan of the previous titles in the franchise. With the adult content included in the game this isn’t for the faint of heart, but definitely worth a rental at the very least. I’d give Duke Nukem Forever a 7.5/10.